Most simply stated, the difference between the System-A and the System-B BS-21 British Standard Taper Pipe Thread Gages is the way the gauges are read/used. The System-A British Standard Taper Pipe Screw Thread Gauges have a single gauge plane which is used as the measurement reference point. 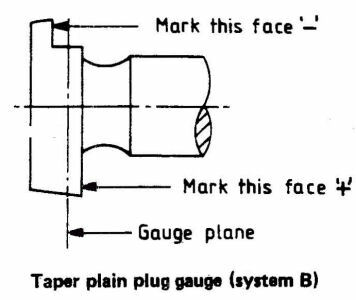 Appropriate use of System-A gages includes taking a measurement from the gage plane to the edge of the part thread. That data is then compared to the data in BS-21 to determine if the part thread is within tolerance. Depending on the thread size and if it is the internal or external product screw thread; the leading edge of the BS-21 tapered product screw thread must fall within plus or minus 1.0 to 1.5 turns from the notch or surface of the British Standard Taper Pipe Screw Thread Gage. 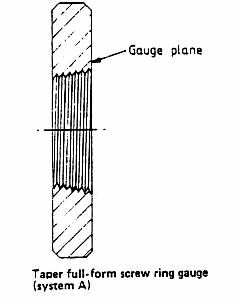 If you notice that this method of reading the gauge is similar to the NPT series of gages which is read/used with plus or minus 1 turn from the notch or edge of the NPT gauge. Because of that, the British Standard System A is a favored by the USA gage makers who use the gage exactly as they would a NPT gage by counting +/- 1 turn for all sizes. This method is good because it does not require any training of the user of the gauge, and the resulting product thread is closer to product thread nominal size; but it also reduces the manufacturing tolerance for the product thread and thus increases the production costs. System-A design has been abandoned in the ISO 7/2 gages. 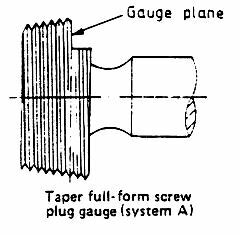 For the System-A British Standard Taper Pipe Screw Plug Gage the gauge plane is a notch at the large end of the British Standard Taper Pipe Screw Plug Gage. The British Standard Taper Pipe Screw Plug Gauge is applied to the product screw thread and is gauged based on the measured value from the end of the product screw thread to the gauge plane on the British Standard Taper Pipe Screw Plug Gage. 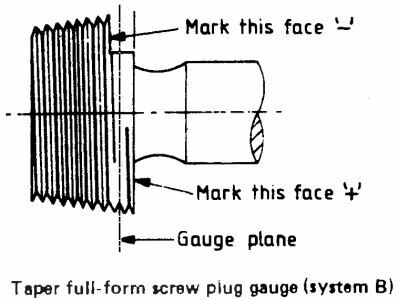 To correctly use/read the British Standard Taper Pipe Screw Plug Gauge compare the resultant measurement with the information given in BS-21. 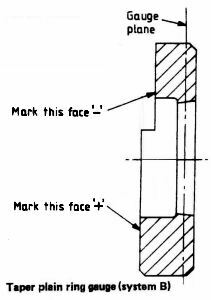 If counting turns is your desired method of testing the part; for consistency I suggest that you keep with the NPT norm of +/- 1 turn from end of the product screw thread to the gauge plane. Be advised that BS-21 the number of turns varies depending on the thread size from the from +/-1.2 turns to +/-1.5 turns from the end of the product screw thread to the gauge plane. For the System-A British Standard Taper Pipe Screw Ring Gage the gauge plane is the surface which is presented to the product screw thread; not the surface used to take the part size measurement. The pitch diameter at the ring gage gauge plane is identical to the pitch diameter of the plug gage gauge plane. The British Standard Taper Pipe Screw Ring Gauge is applied to the product screw thread and is gauged based on the measured value from the end of the product screw thread to the British Standard Taper Pipe Screw Ring Gage surface nearest the end of the product screw thread. To correctly use/read the British Standard Taper Pipe Screw Ring Gauge compare the resultant measurement with the information given in BS-21. If counting turns is your desired method of testing the part; for consistency I suggest that you keep with the NPT norm of +/- 1 turn from end of the product screw thread to the gauge plane. Be advised that BS-21 the number of turns varies depending on the thread size from the from +/-1 turn to +/-1.5 turns from the end of the product screw thread to the gauge plane. The System-B British Standard Taper Pipe Screw Thread Gauges have the tolerance limits ground into the System-B British Standard Taper Pipe Screw Thread Gages as a step. This allows for easy determination of the standard allowed pipe screw thread tolerance limits. One end of the System-B British Standard Taper Pipe Screw Thread Gauge is the maximum taper screw thread size and the step is the minimum taper screw thread size. The System-B British Standard Taper Pipe Screw Thread Gages have the steps marked with a plus (+) and a minus (-) to indicate the maximum and minimum product taper screw thread positions. The System-B British Standard Taper Pipe Screw Thread Gauge is applied to the product taper screw thread which is gauged based on how the end of the product taper screw thread presents itself to the System-B British Standard Taper Pipe Screw Thread Gage. The end of the product taper screw thread must fall between the end of the System-B British Standard Taper Pipe Screw Thread Gauge and the gage step. This system is considered the standard by the UK gauge makers, and is preferred elsewhere in the world. When we sell NPT taper screw thread gages to European customers they prefer the two-step design as described above. The 2-step System-B gage paradigm is what has been adopted for the ISO 7/2 pipe screw thread gages. The BS-21 British Standard System-B also has defined System-B British Standard Plain Taper Pipe Gauges. The System-B British Standard Plain Taper Pipe Gages are used to check the taper of the screw thread at the crest of the product screw thread. One end of the System-B British Standard Plain Taper Pipe Gauge is the maximum product screw thread size and the gauge step is the minimum product screw thread size. The System-B British Standard Plain Taper Pipe Gages have the steps marked with a plus (+) and a minus(-) to indicate the maximum and minimum product screw thread positions. The System-B British Standard Plain Taper Pipe Gauge is applied to the product screw thread and the product is gauged based on how the end of the product screw thread presents itself to the System-B British Standard Plain Taper Pipe Gage. The end of the product screw thread must fall between the end of the System-B British Standard Plain Taper Pipe Gauge and the gage step. The System-B British Standard Plain Taper Pipe Gauges are to be used in addition to the System-B British Standard Taper Screw Thread Pipe Gages; not in place of them. The System-B Plain Taper Plug Gage is not carried over to ISO 7/2; however; the System-B Plain Taper Ring Gage is found in the gages designed for ISO 7/2. The term:System-B is not found in ISO 7/2. The product screw thread of the ISO-7 is technically equivalent to the product screw thread of BS-21. The ISO-7 screw thread gages are different than the BS-21 screw thread gauges because of differences in the gage design paradigms used by different standards bodies. Because of these two facts, two conclusions can be made. First; BS-21 screw thread gauges may be used to measure ISO-7 screw threaded product, and ISO-7 screw thread gages can be used to measure BS-21 screw threaded products. 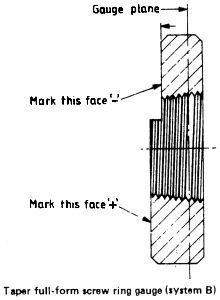 Second; in a gauge dispute all parties should harmonize the screw thread gages to the same standard. The use of screw thread gauges all made to the same standard may not resolve the dispute, but it should make the resolution easier.